McKagan's writing with Jane's, but is he member? 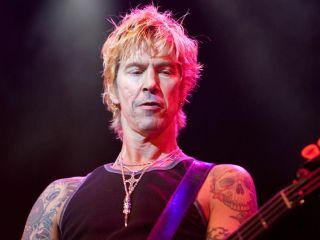 With Slash's solo record about to debut, it appears that another Velvet Revolver bandmate is getting busy: according to reports, bassist Duff McKagan is writing and recording with Jane's Addiction. Whether original Jane's bassist Eric Avery has left the band entirely isn't certain, but he's indicated recently that all is not hunky-dory with him and the group: "fyi, to answer the question directly, i am not writing with janes addiction" read one of his Tweets. Of course, this would not be the first time that Avery has stepped aside from Jane's Addiction: he didn't participate in their 1997 and 2001 reunions and was replaced at various points by Flea, Martin LeNoble and Chris Chaney. No one from the Jane's Addiction camp has confirmed McKagan's involvement, but Perry Farrell sounds ecstatic as to the group's progress. On his Twitter account he said, "David, Stephen, and I with new writing partner, went into the garage. Felt like old days, except no cassette recorder. Crafting w/Protools." Making things even weirder, Avery has Tweeted that he's due to play with Jane's Addiction on their Australian tour (he says his folks keep asking), which is booked from 20 February through 1 March. So while nothing's shocking, when it comes to this crew, it sure is freakin' hard to figure out.